Cordillera De Robles is a hunters paradise for those seeking tranquility only an hour and fifteen minutes from downtown San Antonio. Only 8 miles from the Hill Country State Natural Area, a 5,369-acre area where the public can horseback ride, hike, and mountain bike the location of Cordillera De Robles is truly ideal. At the end of the quiet and secluded road of PR 238 you will arrive to a ranch full of wildlife and incredible breathtaking views of the Tarpley and Utopia hills. This ranch provides a picturesque hill country landscape with multiple building sites, well cared for native grasses and tree species and of course spectacular sunrises and sunsets. The current owner has done an extremely good job clearing the land of cedar creating extreme views while maintaining great habitat for wildlife to thrive. 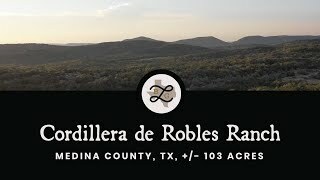 Cordillera De Robles is being offered in two tracts of approximately 52 and 51 acres each. The ranch is a sportsman&apos;s paradise boasting hunting of whitetail, turkey, dove, quail, predators and hogs and the occasional exotic. The exotics, predators and hogs allow for hunting year-round and in between deer, turkey dove, and quail season. The owner has seen several coveys of quail return since his clearing and incredible land stewardship practice has been in place allowing for knee high native grass to return making way for native game such as the quail to return. The current owner has not hunted the quail allowing for them to flourish and coveys to build in size. There is one water well on the property located along the south fence line, the water well Is approximately 360 Ft deep and equipped with a submersible pump, pressure tank and booster pump. There is one septic tank located on the property about 200 feet in from the water well location. From Tarpley: Head down FM 462 7.4 Miles then take a left onto Private Road 238 marked with Texas Premier Ranch Realty sign. Go 2.4 miles up Private Road 238 until you come to ranch with Cedar fence. Gate is marked with Texas Premier Ranch Realty sign. From Hondo: Head up FM 462 for 18 miles then take a right onto Private Road 238 marked with Texas Premier Ranch Realty sign. Go 2.4 miles up Private Road 238 until you come to ranch with Cedar fence. Gate is marked with Texas Premier Ranch Realty sign. © 2016 CoStar Group, Inc.
© 2019 Texas Alliance of Land Brokers. All rights reserved.